This article was originally published on CREATIVE REVIEW and is republished here with permission. This is part one, and Rebecca McClelland will be following up with part two which takes a more in depth look at collaborative photographic theory soon. Documentary photography has always been critically assessed by its ability to close the space between subject and photographer: The more smaller that space is, the more convincing the work. When we think of the iconic images of our time, their success has been to capture succinctly the human condition, packaged up neatly with tidy composition and pathos. So what happens when the subject of the camera’s lens becomes the co-director of the work itself? 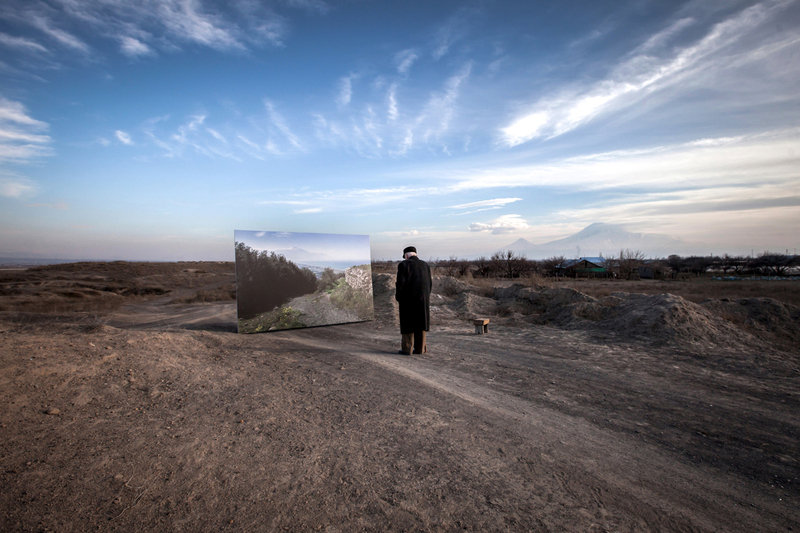 Diàna Markosian, a 27 year-old Armenian-American photographer and 2016 Magnum Photos nominee, will discuss her work later at Photo London on May 18. You could be forgiven for placing Markosian within the traditional social documentarian context, the kind that Magnum is historically known for. Yet what is exciting about Markosian’s work is that she belongs to a new wave of ‘producers of situations’, artists who invite their subjects – be they genocide survivors, refugees or family members – to participate, direct and influence the final outcome of their work. Undoubtedly highly regarded, her work is often published in National Geographic Magazine, The New Yorker and The New York Times. In addition, she is a recent recipient of a Pulitzer Center grant for photography. Thematically, Markosian’s work explores the psychological aspects of loss, trauma and memory; feelings, put simply, that were evoked in her after long-term separation from her father on emigrating to California as a child. Her series, ‘School Number 1’ is the result of a personal project that Time magazine later commissioned. Markosian revisited the site of the Beslan school siege of September 1, 2004 . Her aim was to create a panoramic documentary series that investigated the deep sense of trauma that has marked this community ever since. ‘First Bell’ or ‘Knowledge Day’, the first day of the Russian school calendar, was a day of great excitement in the town. The children were eager to either return to old friends or make new ones. So when the first shots ran out, the school children thought they were celebratory firecrackers. Within minutes of the families entering the school that day, Chechen and Ingush militants had surrounded it, setting explosives and seizing over 1,200 hostages, who were corralled into a gymnasium. There they were all kept without food or water, the unfortunate executed. On the third day, the school was stormed by the Russian security forces. The resulting gun battle led to the death of 330 innocent people, 186 of which were children. Just over a decade later, the school still stands as a shrine to those who lost their lives in what is notably Russia’s worst terrorist attack in recent history. Two weeks into her assignment and frustrated with the “empty pictures” she had so far taken, Markosian temporarily abandoned her camera. 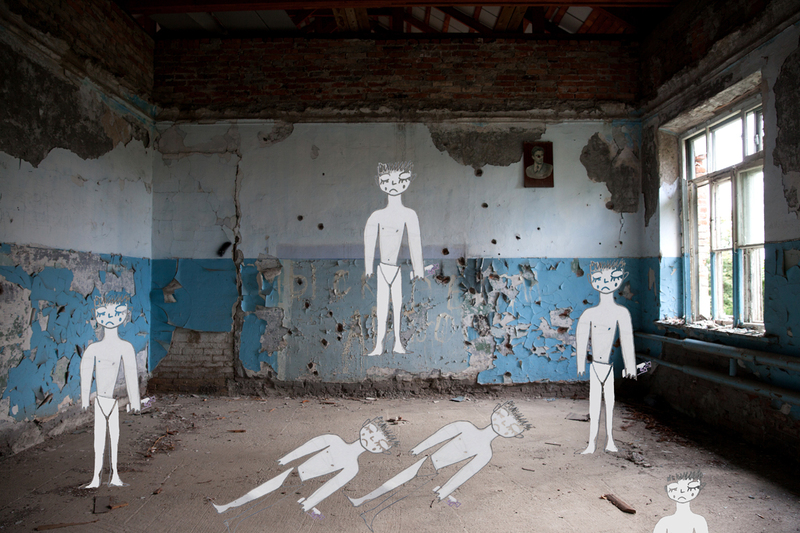 Her research led her to discover some drawings that the children had made several days after the siege with their psychological therapist. Setting up a simple art studio at the site, she invited the victims to collaborate in the imagemaking process with her, making collages, annotations and illustrations from their memories. This new method enabled for a more ‘authored’ and authentic relationship with events. Through a discussion of the drawings she was able to access a greater understanding of the deeply traumatic and often buried memories from those dark days. 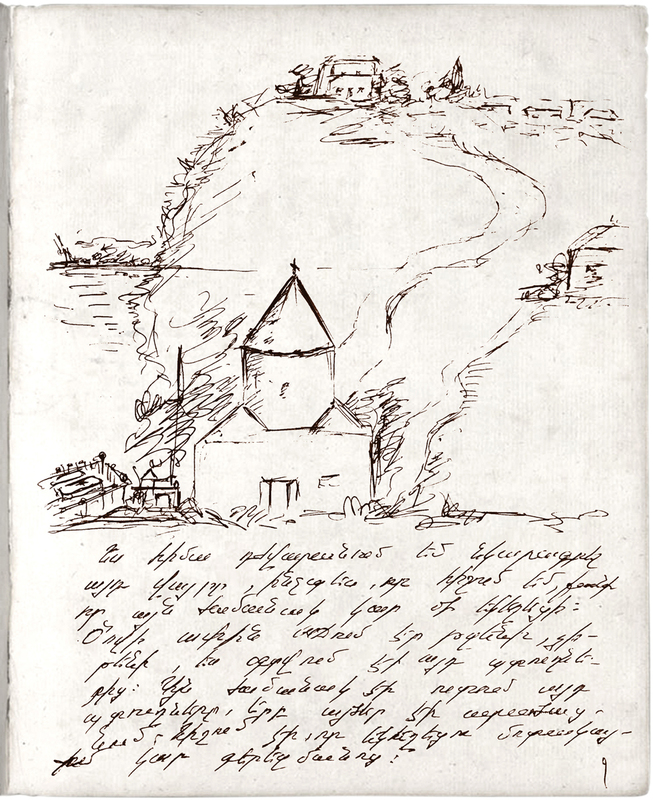 The children cut up the original drawings and assembled them onto Markosian’s photography, building graphic assemblages that represented scenes from the siege. 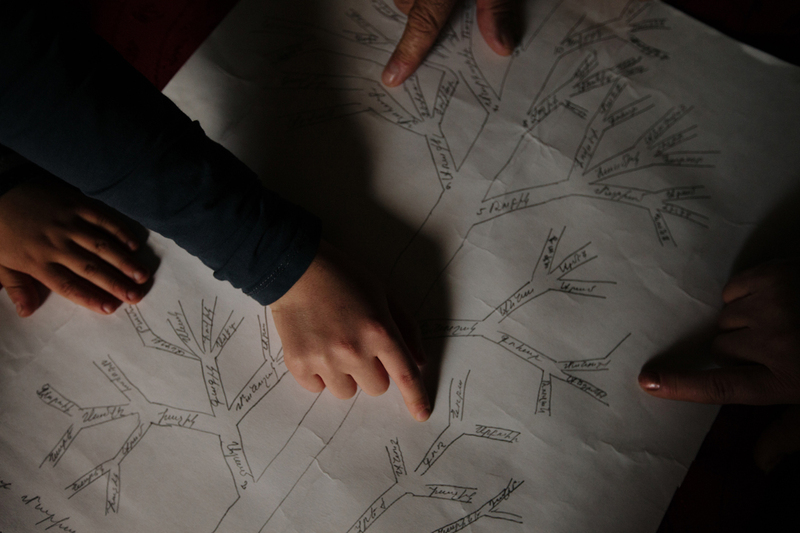 During the month that she lived in Beslan, Markosian returned to the school repeatedly with survivors, some of whom had not been back to the site since the attack. Within the musty, dark, bullet-ridden corridors she asked them to remember their experiences so she could photograph them in this meditative state. 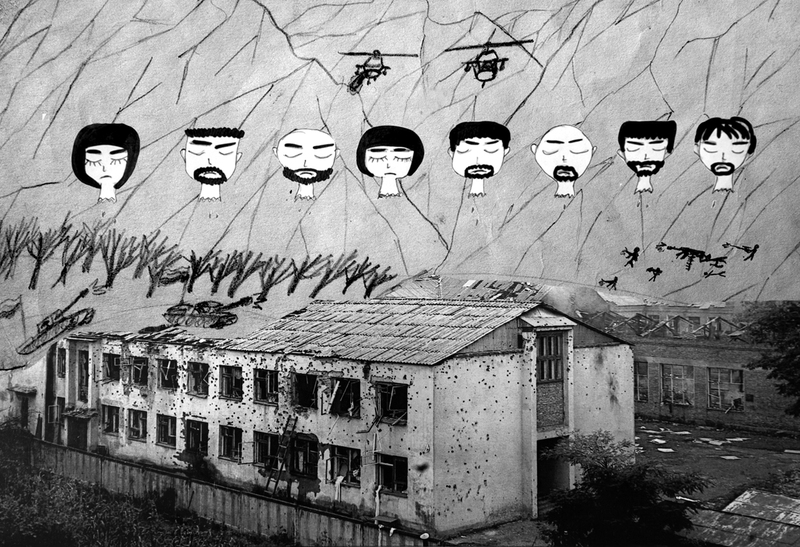 In one black and white topographical landscape of the outside of the post-siege school, drawings of a row of dark-haired human heads by one survivor float above the school: at least two are women supporting the reports that women were among the terrorists. Many of the faces are framed by beards, all with their eyes closed. Machine guns and tanks have been drawn on the edges of the photograph and helicopters hang above. The explicit ‘before and after’ of the tragedy is at once strangely present in the images. The drawn figures haunt the photographs like characters in their own macabre mise en scène. 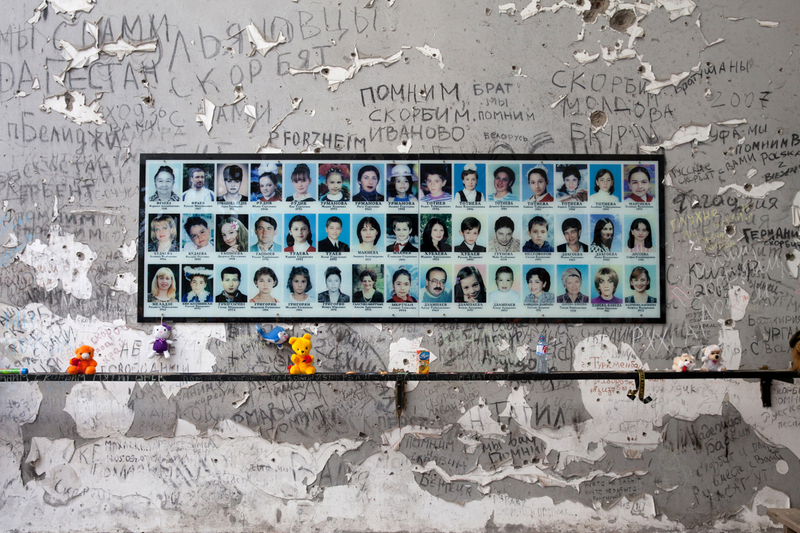 Tiny, white and crying; they fill the image, the ghosts of Beslan’s dead. The intrinsic folk-like quality of the drawings serves to amplify the weight of the information they carry. Innocent lives were lost here and what remains are scars etched into the walls of this building and the memories and lives of the communtity it was supposed to serve. Markosian also made portraits of the survivors and studio still-lifes of the artifacts and evidence that was left at the school. She incorporated vernacular photography from family albums with CCTV footage, which was edited for her by a survivor. This kind of forensic work can be problematic on several levels. The presentation of photography as evidence is no new thing and has been widely adopted my millennial documentarians eager to present a rational view of the world in crisis. Whilst many play with or subvert its apparent plausibility to present an objective representation of truth, Markosian brings the two genres of the evidential and the constructed into conversation with each other; to present an acutely balanced testimonial of facts and fiction. In perhaps her most well-known project, ‘1915’, Markosian takes a radical point of conceptual departure bringing the collaborative process to the foreground in the work. 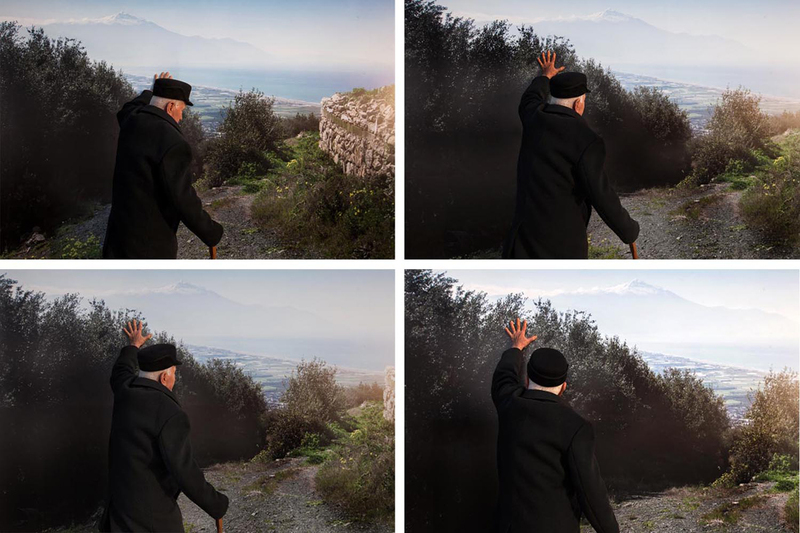 The series investigates the personal narrative of three survivors of the Armenian genocide. The first Balkan war ended in 1915 in catastrophic defeat for the Ottoman Empire and a loss of 85% of its European territory. 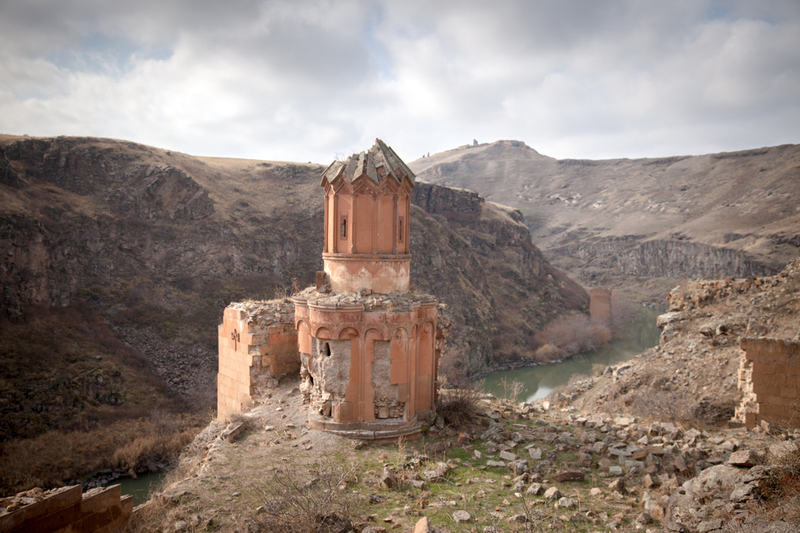 Anatolia, the Armenian ancestral homeland, became the last refuge of the ruling Ottoman army. On Red Sunday, April 24, 1915 the deportations began. Intellectuals and leaders, editors, clergy, dentists, and merchants; the Armenian cultural and community elite, were gathered, arrested and deported. The majority were eventually killed. Those who were lucky enough to flee, sought refugee in nearby Syria and its surrounding lands leaving their homeland to be sacked and destroyed; mere ruined memories of a minority old enough to remember. Despite the deaths of an estimated 1.5 million Armenians, the Turkish authorities still refuse to acknowledge that what took place was genocide. 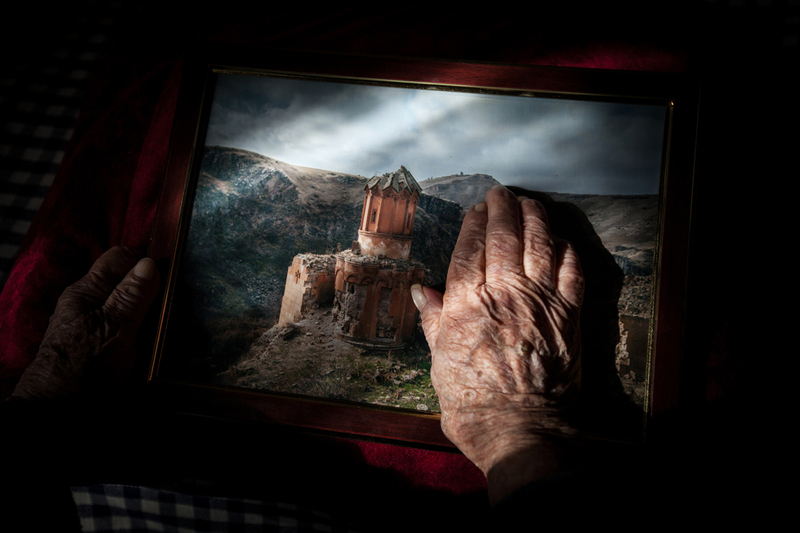 One hundred years later, the Smithsonian magazine took an interest in Markosian’s idea to track down survivors for an anniversary piece and funded her project. She started by mining the public records for names and addresses of survivors she could interview and photograph. Her research led her to just ten surviving centenarians, which then quickly reduced to just three. She asked them to recount their childhood memories. 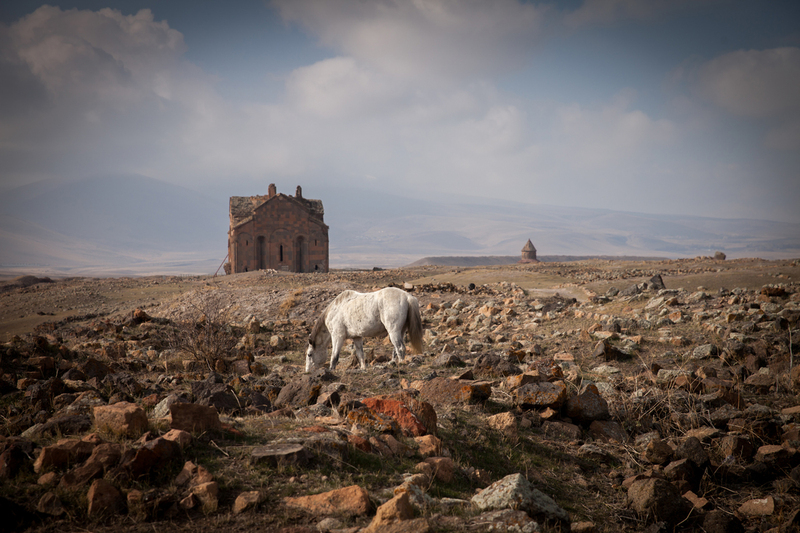 They told her stories of their homeland; of the snow capped mountains of Ararat, of the ancient capital and Armenian heartland Ani, formerly known as the city of 1,001 churches, which now lies in ruins. Of the massacre of their relatives, of the rivers that turned “red, full of blood”. 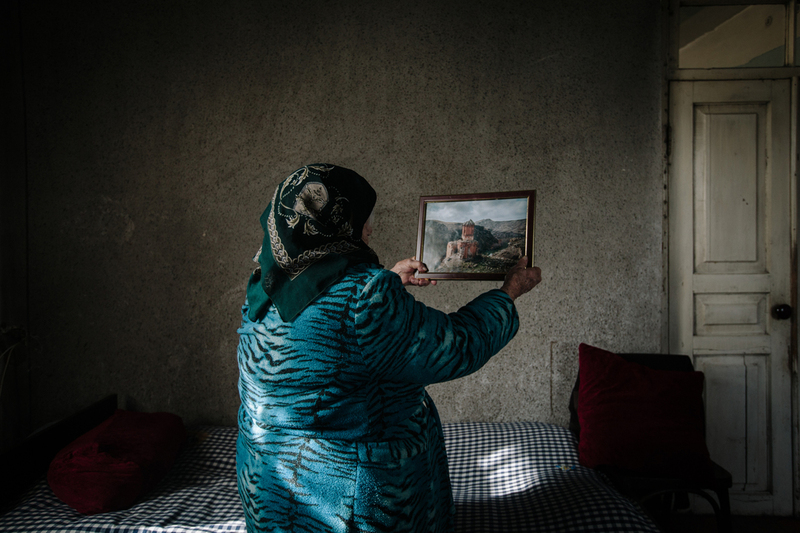 Markosian decided that in order to make the work, she would fulfill a wish for each of them by retrieving something from their ruined homeland for them. Mariam from Sason requested a handful of soil for her to be buried in, whilst Movses from Musa Dagh asked that his portrait would be left in the ruins of his church. 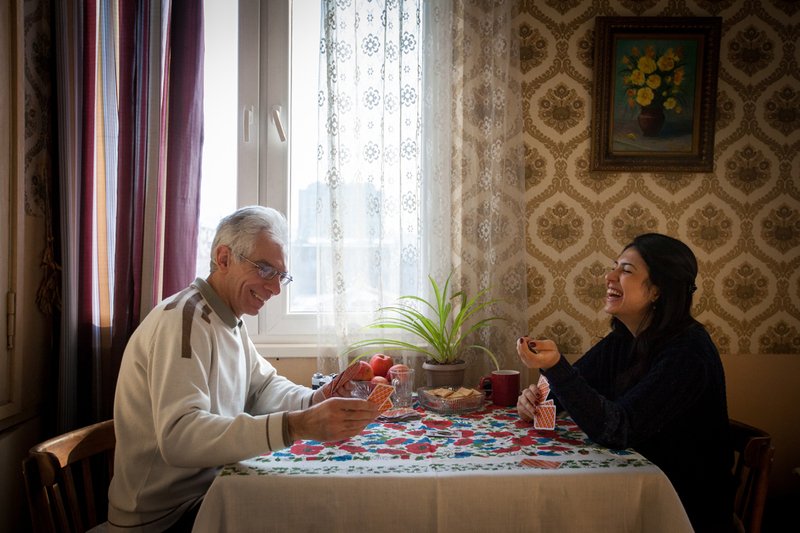 Yepraksia from Kars asked that she find her older brother from whom she has been separated. When working in this way, creative ownership and authorial power oscillates between Markosian – the producer – and her participants. In allowing the three survivors to direct her, she relinquishes autonomy over her own art in much the same way that the Deutsche Börse Photography Foundation Prize 2017 finalist Sophie Calle does in her series Please Follow Me. The work is like a game with a clear set of rules to follow. For 1915, Markosian printed large billboards of the images of her participants’ homelands and presented them to the survivors as a surprise, recording and documenting their reactions. These video pieces form a large part of the body of work, along with evidential photographs, portraits, and archived collected materials. It is perhaps the image of Movses, standing with sagging shoulders against the backdrop of his motherland, which is the most heartachingly unforgettable and epic. He fled from the village with his father to Syria in 1915. He was overwhelmed when presented with the physicality of his wish, he never imagined he would see his homeland again some 100 years later. “It brought them closure in a way that they didn’t have from the government, either in Armenia or Turkey,” Markosian has said. She used the sale of limited edition Giclee prints of the images to raise funds for the three survivors to have their homes renovated and rebuilt installing essentials like new windows, roofs, kitchen and bathroom. If art has borrowed from the language of journalism since the French Revolution, then it has taken a long time for journalism to wake up to the richness of a more experiential approach to narrative and the social condition. The danger for some journalism today is that it remains anchored in its obsession with simply bearing witness without a more meaningful consideration of the citizen’s own contribution to the story. This participatory impulse, although by no means new, is refreshing and will no doubt revitalise visual journalism, influencing generations of imagemakers in the future. This article was originally published on CREATIVE REVIEW and is republished here with permission. Tagged collaboration, Creative Review, Diàna Markosian, documentary photography, Magnum Photos, Rebecca McClelland.